Welcome, to my misting class! I hope you have a great time learning a couple fun techniques using your mists! You can use ANY mists you have on hand for these techniques. Each will give you a little different look, as some are more pigmented than others, have or don't have sparkle, are more opaque, etc. So experiment and have fun! *mists: these can include Maya Mists, Glimmer Mists, Perfect Pearls Mists, Smooch Mists, etc. You can even make your own mists by using powdered perfect pearls & distress reinkers by following this fun video by Tim Holtz http://www.youtube.com/watch?v=9zm5JTf2 ... re=related Keep in mind you can experiment and just use the perfect pearls and water (no ink) or just the ink and water (no pearls) for different looks! 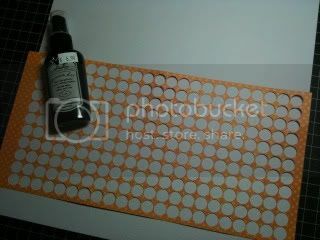 *stamp, embossing ink (like VersaMark), embossing powders (I love the ones by American Crafts), heat gun/tool. *Be sure to shake your mists so that all the color and glimmer is evenly distributed in the bottle. If you notice your mists are spraying in "globs" instead of a fine mist, try rolling the bottle to mix it instead of shaking it. The "globs" come from air bubbles getting trapped in the sprayer. 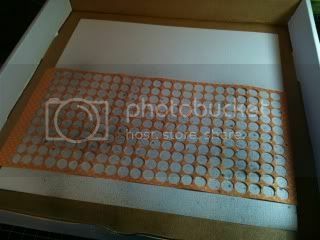 *If you get impatient, it is perfectly fine to use a heat gun to speed up the drying time. *Heavier weighted paper (like Bazzill) works better than the thinner stuff, since thinner paper tends to tear and curl easier when wet. *Because you are moistening paper with mists, it does have a tendency to curl or warp. This can easily be remedied by letting the paper sit under something heavy for a few hours. Or, if you are impatient, you can sort of mold/smooth it back in place gently with your hands. The first technique I want to show you is called masking. Masking is basically where you cover part of your project with a die cut, sticker or some other object to essentially protect it from the mist. When you lift off the object after spraying, you will be left with an open area in whatever shape you used that is NOT misted/colored. It's fun! Let's try it. On this project, I decided I wanted to mask my sentiment on this card. So I used some old, old, old letter stickers and a silk flower. I placed them on my pre-cut cardstock base and into a clean pizza box to protect my work space. Then I embellished it and put my card together. To make the sentiment stand out a little better, I used a white pen to outline the letters. 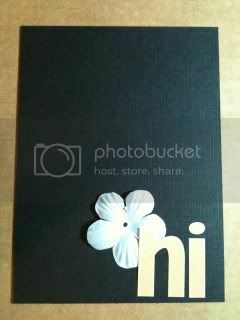 I decided I wanted to tuck a flower in behind the "h" so I traced my letter sticker with more black cardstock, cut it out and outlined it in white so that it matches the misted "i" that is flat on the page. The bad thing about misting is sometimes the sparkle is hard to capture with a camera, but I think you get the idea! Now that you have the idea, let's move on to another technique that's similar to the one above. 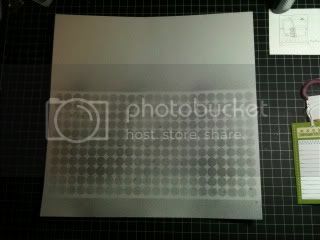 Here, we're going to use the NEGATIVE or the leftovers of a die cut image. So you know how when you use your Cricut to cut out a star, once you remove the star itself you're left with a piece of paper that has the outline of the star shape? Yup, we're going to use this negative space with our mists! 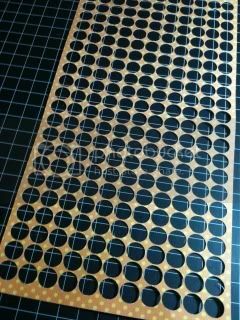 I cut oodles of small (1/2") circles to use in class at my LSS out of this paper with my Cricut. When I pulled out all the circles to give to my students, I LOVED what I was left with. Isn't this piece of paper cool? I then knew exactly what I wanted to do with it! 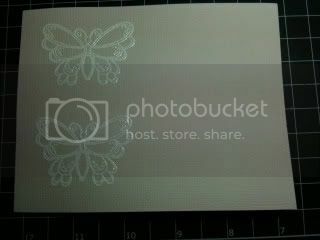 I grabbed a pale gray piece of cardstock and my Glimmer Mist in Silver Sugar. Because this sheet of dots was so big, I didn't want it to move around. So I used a few dots of removable adhesive on the back of it to hold it in place. Again, place this in a box or on a large craft mat so you protect your work surface and spray as many times over it as desired. I probably used 5-6 sprays on this one. Then remove the mask and rub off the adhesive and you will have this. It looks darker here because the mist hasn't dried yet in this photo. Cool, huh? 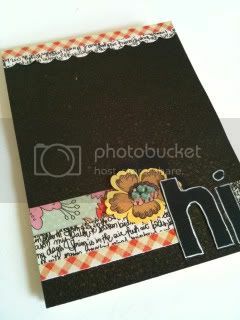 I then used this piece of cardstock as my base and made this page. Ok, now that you have the basics down, let's try something a little different. This next technique is really cool and will look different depending on what kind of stamps you use. I decided to use a butterfly stamp that had a lot of open areas so I could highlight the technique. This is a Unity Stamp that was offered as part of our monthly stamp sets a few months ago. I love it! 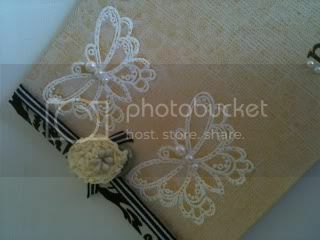 Again, place in your box or on your craft mat and spritz! 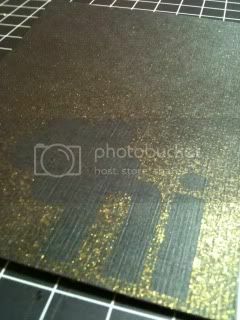 I was a bit heavier with the mist here as I really wanted to cover the cardstock with gold. 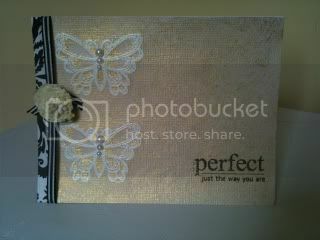 I used the same Perfect Pearls Mist in Sunshine Sparkle that I used on my "hi" card... see how the look is different? And I love how the embossed portions resist the mist so they stay white, and the mist fills in all the open spots in the stamp. You can also "resist" using rub-ons! I didn't show you this, but you basically just rub on the rub-on, spritz with mist and then either wipe the mist from the rub-on (I like to use a baby wipe) OR you can use a bit of scotch tape to lift the rub-on from the paper (work slowly and carefully). Did you have fun?! I hope you learned something!!! Now I want you to break out those mists and not be afraid of them! Experiment using various ways to mask & resist. Look around your craft space for things to use. Do you have any old Heidi Swapp masks from back in the day? She loved to use these with spray paint, but mists would be great with them! 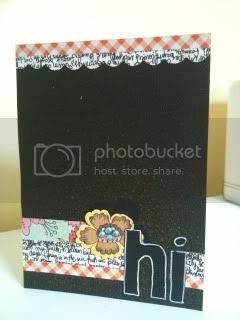 Try experimenting with dark vs. light cardstocks like I did with both of my cards. I used the exact same color mist on both and got totally different looks! Break out those stamps and try the resist technique. It's such a fun and easy way to use your stamps. Now it's your turn! Complete this challenge by using any of the misting techniques from my class on any project (layout, card, altered item, etc.) and upload it to our gallery in the proper folder (Mist, Spritz, Splat) under "May Crop Challenges & Classes" by Sunday, May 21st at midnight EST. You may enter up to THREE projects for this class/challenge. Two page layouts count as one entry, even if you upload each side separately. Projects must be NEWLY CREATED specifically for this challenge. You cannot combine challenges. Have fun and let me know here if you have questions! Last edited by alissa103 on Fri May 13, 2011 9:30 am, edited 1 time in total. So we can do anything- because i don't have any embossing ink or a heat tool? If you don't have a heat tool, just don't do the resist technique, do one of the masking ones. Or try it with the rub-ons I mentioned instead. Love love love this, Alissa!! I only have a handful of mists--but I hope to try some of these!!! Cool class and ideas! Thanks for sharing! Alissa, do you find that the pizza box is deep enough that you don't get overspray onto your table and everything? I used a box that has really tall flaps, but it was hard to get the spray over the edge--so I have a bunch of splats!! Also, is your project laying flat and then you have to angle the bottle down to spray on the LO? The pizza box is plenty deep, but I also have a mat underneath the box, so if it does happen to over spray a little, it doesn't get on my actual desk. Yes, my projects are laying flat and I did angle my bottle. If it's easier for you to have more control to do it in reverse, that works, too (a lot of my students at LSS do this, works fine). I used the "Negative Space Masking" technique using the Little Yellow Bicycle lace cut Gear cardstock for my masking. I used Tattered Angels Glimmer Mist. 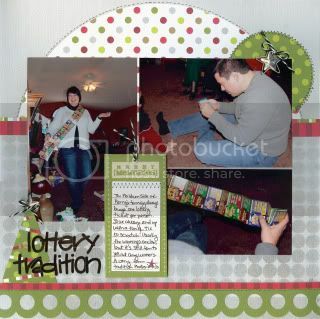 Love your page, Deanna - that gear pattern is fabulous! wow, you girls have been busy! The gallery for my class is filling up. Way to go on getting misty! You all have praise on your projects from me!